Up from the depths, 30 stories high, breathes fire, his head in the sky. Godzilla! Godzilla! Godzilla! And Godzooky... GODZILLA! Captain Carl Majors leads the Calico Team which consists of Professor Quinn Darian, Brock, her assistant, and some goofy kid named Pete. I guess Pete is one of them's kid or kid brother or something... I doubt he is any relation to Brock though (just a wild guess)... Anyways the Calico Team travels around the world in this cool boat that transforms into a hydrofoil stirring up ancient monsters and stuff like that best left alone. Godzilla is sick of looking after his dumbass goofy son Godzooky and turns him over to the Calico Team. In return they get to call up Godzilla with this sonic gizmo whenever the get menaced by some creature and he will rise up out of the water and bail them out. One interesting thing about this Godzilla is that in addition to his standard fire-breath he could also shoot lasers from his eyes! These were enjoyable little stories from the 1970's with lots of SF overtures. It first aired as The Godzilla Power Hour which had 1 Godzilla episode and 1 Jana of the Jungle episode. 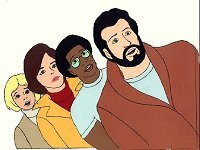 In November 1978 Jonny Quest joined the lineup and the show was now called The Godzilla Super 90. The 2nd season aired in 1979 and continued to play re-runs over over the next two years under various names such as The Godzilla Show, The Godzilla-Dynomutt Hour, and The Godzilla-Hong Kong Phooey Hour. The last show was aired on September 5, 1981 and it wasn't seen again until a brief revival in 1998 on Cartoon Network as part of the hype surrounding the 1998 American Godzilla Movie.